The new Laval amphitheater will be called the Place Bell and is supposed to open its doors in September 2017. There will be a total of 3 ice rinks in the Place Bell; the first one with the NHL’s dimensions, the second with the Olympic dimensions and the third will be smaller and only use for practices. The bleachers of the main ice can accommodate 10,000 and count 46 corporate lodges. 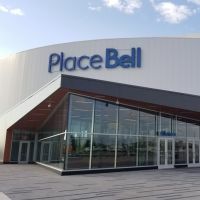 The Laval Place Bell will be hosting international events and will also be the home the Laval Rocket hockey team.